SOMETHING NEW - YOUR ONE STOP LITTLE WEDDING SHOP!...well almost. You can find Something New in the Mandurah Ocean Marina near Dolphin Quay. Something New has been trading here for nearly 10 years. Our store entrance is on Fathom Turn, Mandurah. Something New is your go to shop for all things wedding. If you can't find it here we can usually make it or find it for you. 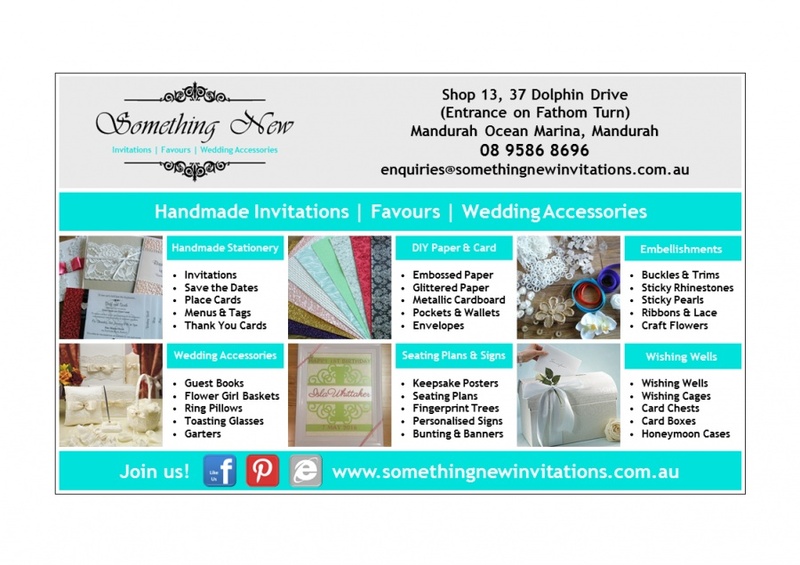 At Something New, we do not inflate our prices just because you mentioned the word "wedding". Many of our wedding accessories and small wedding décor items can be hired, helping you stay within budget and saving you time and the hassle later on trying to sell everything you no longer need. At Something New, we hand make many of our products. Our most popular hand made products are our wedding invitations. Our handmade invitations are also suitable for engagement parties, bridal showers and hens nights, baby showers, christenings and baptisms and even birthdays and anniversaries. Not local to the Mandurah, Rockingham or Pinjarra area? Can't make it to our store? You can telephone, email or Facebook messenger your enquiry or order to us.